Shake Radio is a new and modern way for young students to challenge their English through one of the most fascinating instruments of our time: RADIO! 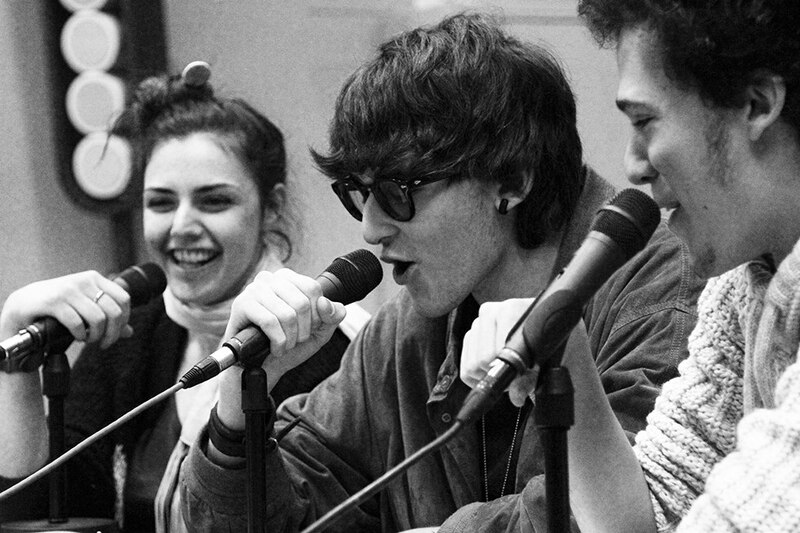 Shakespeare would have loved to speak through the microphone and this is why we bring him right into your schools and theatres: an hour and a half of “on air” fun where students construct their own radio show introducing the Bard to the listeners. The show, the acting, the sounds, the debate, the mixing, the music and even the logo are all created by the kids with the help of our fantastic radio and theatre experts. Give your students a shake and get them “on air” with SHAKE RADIO! Shake Radio is a language workshop for students from 14 to 19 who are learning English at school. Our actors travel (by train, so very ecological!) directly to your school or theatre with all the equipment and install a temporary radio system in your class or on stage. The class of maximum 20 students are divided into different groups which work on creating the program. Each program is made out of the main show, scenes taken from the major Shakespeare plays, sounds which are created on the scene (even horses! ), a debate on the themes involved in the plays, the recording and mixing, music composition (whenever there is a talented musician with the student crew) and a special logo for each class! All this in just two hours workshop! The program is then edited and uploaded online for everyone to listen to.